Luckily, less heinous instincts won out, and the film concluded on a much more cheerful note. The interview—part of EW’s “Untold Stories” series—also touches on the film’s significantly stranger sequel, Bill & Ted’s Bogus Journey. Solomon and Matheson, who were apparently writing and rewriting the movie well into shooting, revealed that, at one point, Moses was going to show up, parting a sea of traffic. Also, Bogus Journey’s weirdest character—Martian supergenius Station—apparently got his name from an improperly deleted location description (Interior–Police Station), which makes as much sense as anything else about that guy. 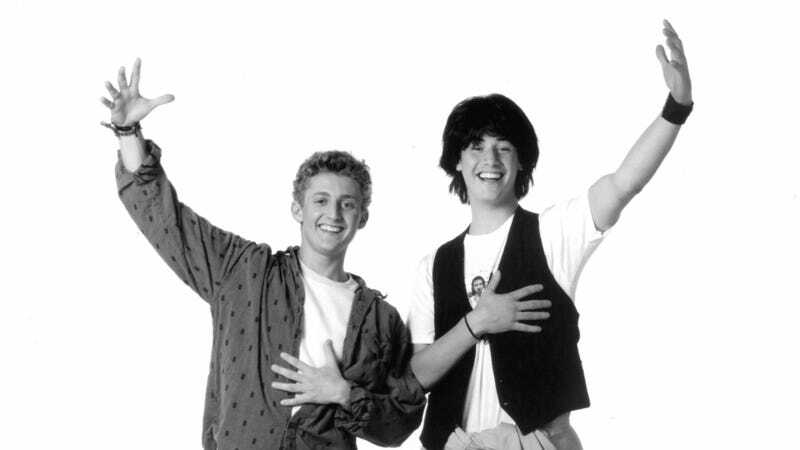 The piece ends with a promise that the four guys are still working on Bill & Ted 3, as they’ve been dutifully saying they are for the last several years.